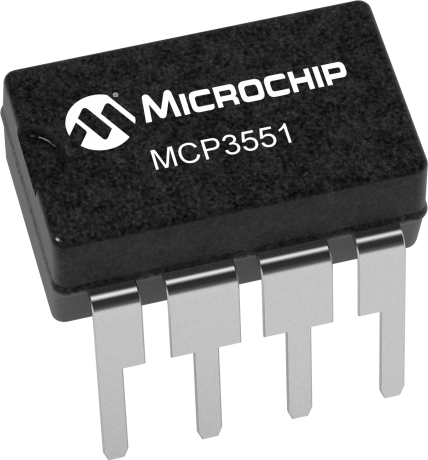 The Microchip Technology Inc. MCP355X devices are 2.7V to 5.5V low-power, 22-bit delta-sigma A/D converters. The devices offer output noise as low as 2.5 µVrms with a total unadjusted error of less than 10 ppm. The family exhibits less than 6 ppm integral non-linearity (INL) error, 3 µV offset error, and 2 ppm full scale error. The MCP355X devices provide high accuracy and low noise performance for applications where sensor measurements such as pressure, temperature, and humidity are performed. With the internal oscillator and high oversampling rate, minimal external components are required for high accuracy applications. The fully differential analog inputs make it compatible with a wide variety of sensor and measurement applications. The MCP355X devices operate from -40°C to +125°C and are available in the space-saving 8-pin MSOP and SOIC packages.